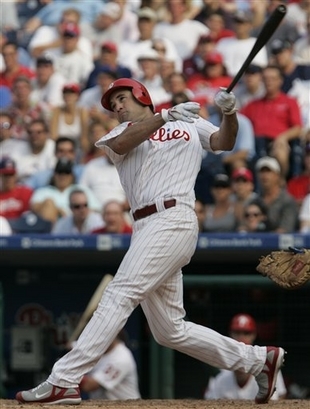 For nine years, Pat Burrell has occupied a spot on the Phillies roster. Whether wearing number 33 or number five, whether playing first base, third base or left field, Burrell has been a known quotient in Philadelphia. Burrell represents the hope we all experience as Philadelphians. A southern-bred, muscular boy with infinite swagger, Burrell came to Philadelphia with loads of hype. He was the next Greg Luzinski, the next Mike Schmidt, the next massive figure to crank home runs into the yellow seats of Veterans Stadium. And maybe Burrell would lead the Phillies to a World Series title. Maybe he would finish as one of the franchise’s greatest sluggers. But the results never quite met the high expectations. In 2002, Burrell broke the glass mirror with an exceptional offensive campaign, hitting 37 home runs at age 25. By the end of the season, he had alerady registered 82 career dingers. But that pace would slow, just as his legs would slow, and his body would ache. After that unbelievable 2002 campaign, General Manager Ed Wade — thinking the kid was on his way to ultra-stardom — signed Burrell to a six-year contract worth $50 million. At the time, it was a monstrous contract, and with its no-trade clause and myriad bonuses, it resembled the type of pact only reserved for the kings of the game. Philadelphians were prepared for six years of unmatched offensive production. Instead, they saw Burrell age very quickly. Injury after injury tolled, and Burrell became a shell of a player — even in 2003, that first season of the massive contract, he produced horrid numbers (.209, 21 HR, 64 RBI). A year removed from a potential MVP campaign, Burrell became public enemy No. 1. The legacy of Pat Burrell in Philadelphia seemed destined to be about a man who fell tragically short of expectations in a starving sports city. But you can thank Chase Utley and Ryan Howard for altering that — the emergence of the Phillies’ premiere bats lifted the weight off Burrell, who by 2006 was platooning with Jeff Conine. While he found a resurgence in 2005, he soon fell into a consistent line of 30 home runs, 90 runs batted in, and a .255 average. Nothing spectacular — nothing like Schmidt — but very solid, and very good following his star teammates. In 2007, the legacy turned. His production — now more of a bonus — was accepted, while his ethic earned praise. Always wanting to play, always in the midst of action, Burrell became something of a clubhouse leader, a 30-year-old veteran who was totally equipped to play in Philadelphia, totally at peace with his abilities. And someone totally able to rise to the ocassion. Take his noted home runs against Billy Wagner during the 2007 season. And take his unbelievable second-half resurgence in 2007, one main reason the Phils were able to overtake the Mets in the National League East. Moreover, his first-half storm in 2008 helped stake the Phils out to a lead in the division, one they’d regain by the end of the campaign. By his final season in Philadelphia, everyone knew what they’d get out of Burrell. Everyone knew he wasn’t the game-changing Hall of Fame player they originally expected. Instead, we knew he was a solid, above-average offensive player with very little defensive abilities. He was a steady power hitter with a knack for a few big hits in big situations. Two stood out in his final season. The first, a two-run home run with two strikes and two outs against San Francisco fastball closer Brian Wilson. Thrown a juicer up high, Burrell slammed the ball into the left field seats, scoring the game-winning runs in an extra-innings win over the Giants. The second will always remain in my mind. Bottom of the seventh inning. Tied 3-3 against the Rays in game five of the World Series. Up until that point, Burrell had been ice cold at the plate, hitless in the series. But all day I’d boasted that The Bat would come through. I posted about the possibility of a key Burrell home run. I told my dad that Pat would come through. Leading off that seventh, Burrell took a pitch square to left-centerfield. I stood at attention as the ball sailed toward the fence — it was going to go over, it had to have! But no, it fell inches short. Literally, inches. While Burrell slowed up, he still coasted into second base with a determined double. And one pinch hitter later, Burrell was trotting off the field, applause at his back — the Philadelphia faithful thanking him. That was it. It seemed perfect. Maybe Pat should’ve deserved a better sendoff. Maybe. But wait — that final moment actually seemed like the perfect close to his Philadelphia career. A player known for his offensive prowess swung a beauty into the night sky, and the ball dropped against the wall. Of course he hit a double — hitting a home run would’ve been too legendary, would’ve been too Hall of Fame. Burrell wasn’t coming through altogether; instead, he was setting up the Phillies for success. He was letting his teammates finish the deed. He came up inches short, just as he came up short of being a true legend. But that’s no problem. Pat Burrell wasn’t Mike Schmidt. He probably wasn’t even Greg Luzinski. But Burrell was always him — always honest, always true, always Philadelphian. The southern boy was always quick to recognize his mistakes, and quick to know when others needed to pick him up. And that’s Burrell’s legacy — while he never will be remembered as one of the franchise’s top players, he’ll always be that top draft pick who found his niche and hit it well. And often. Sure, Pat wasn’t Mike Schmidt. But hey, he was always Pat.